The last time we told you about awesome character-themed hoodies, they were unfortunately mere concepts rather than actual products you could buy. These amazing comic book themed ones, however? Totally a thing, and totally amazing looking - but you've only got until Friday to buy one. The designs come from Etsy User Coyote Pop, who've been doing these limited waves of Comic-book themed hoodies for a while - the latest set of which are on sale this week, until the 23rd, at which point they'll vanish into the ether. Well, they won't be sold any more, but you get what I mean. But what are you waiting for, just look at them! Although for obvious reasons not marketed as such, the hoodies each depict a different hero from across the DC and Marvel rosters, capturing the elements of their suit designs that makes them work just as well as casual hoodies. Some work a bit better than others, but they're all pretty great. Especially Spider-Gwens, because OMG SPIDER-GWEN. 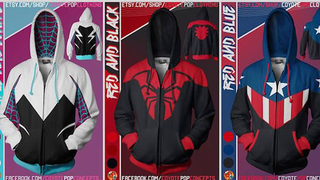 Is it wrong that even as a guy, I totally want the Spider-Gwen Hoodie? That design is so good!